Vahista Ussery, a Registered Dietitian Nutritionist and chef, is the co-founder of To Taste and a member of Chef Cyndie’s K12 Culinary Team. 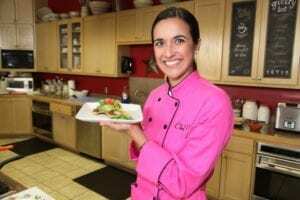 She has a BS in Coordinated Program in Dietetics from Texas Christian University, a MS in Food Systems Administration and MBA from Texas Woman’s University, and a Certificate of Culinary Arts from the Culinary School of Fort Worth. She has run her own catering business, in addition to serving as Menu Planner for Dallas ISD, Dietitian/Supervisor and Chef for Hurst Euless Bedford ISD, and Child Nutrition Consultant for Education Service Center Region 11. Vahista resides in Fort Worth, TX with her husband, baby boy, and kale eating chocolate lab mix. To Taste is a culinary nutrition consulting and education company. To Taste believes the best way to gain control of your health is through cooking. When you cook, you decide what goes into your body. To Taste works with companies and organizations to teach their employees, clientele, or the public how to cook with nutrition at the foundation. School foodservice, teaching kids to cook, and working with community organizations are the focus! Well, being a Registered Dietitian Nutritionist and Chef, healthful items are the norm! I believe in serving both nutritious and delicious recipes. I hate when I hear people say healthy food doesn’t taste good. I dream of a day where “healthy food” is just food! I also believe in indulgences every now and then or in small bites, especially when it comes to dessert. Balance is also a key ingredient of eating healthy! Any prediction on future trends? Definitely a continuation of the current farm to table movement. Local ingredients are healthier, tastier, and better for the environment. Win, win! More fusion cuisine. Our country is becoming more and more diverse, and kids are being exposed to all sorts of cuisine. To them, ethnic food is really just normal food. I see lots of cross-over of ethnic ingredients into mainstream American cuisine. Sriracha is a prime example! One recipe for home (Farro Spring Salad) and one for schools (Roasted Parmesan Broccoli). The Farro Spring Salad features my favorite spring vegetable, asparagus! The Broccoli recipe was developed for North Carolina’s Farm to School program as part of Chef Cyndie’s K12 Culinary Team. I like introducing schools to a different way of preparing broccoli; roasting rather than steaming! I had so much inspiration to become a chef growing up as I’m from a family of excellent cooks! My grandmas on bothsides, my dad, and aunt…all inspiring! Professionally, I’m lucky to have both nutrition and cooking mentors, including Karen Garey, RDN, Marybeth Ratzloff, MS, RDN, and Chef Cyndie Story, PhD, RDN, CC, SNS. My nutrition professors at TCU and my culinary instructors at the Culinary School of Fort Worth, especially Duane Thompson and Gwin Grimes were a great influence on my success! When I teach people a new cooking skill, and I see that aha moment! One of my favorite memories was when I was teaching a group how to cut a bell pepper, and someone in the audience declared “that’s life changing!” The whole goal of our company is to get people back in the kitchen cooking again, so every time we make that easier on them, it feels awesome! Learning to balance nutrition with deliciousness. When I first started culinary school, I was also in college studying to become a Registered Dietitian Nutritionist. I struggled when cooking with clarified butter and cream, salting to taste, and deep fat frying, thinking constantly about the nutrition behind these ingredients and techniques. I learned that it is all about balance, and that it really is ok to not always obsess over calories and fat! We can eat butter, salt, fried foods, etc. as long as we are balancing our meals with tons of heart healthy veggies, fruit, and whole grains. There is a place in our diets for all natural foods! Probably every dish I learned to make when studying Italian cuisine in Florence! 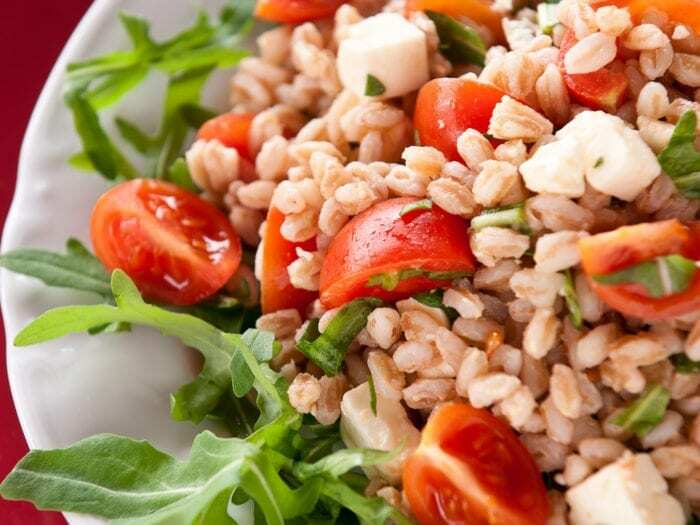 Farro Spring SaladThe Farro Spring Salad features my favorite spring vegetable, asparagus! The Broccoli recipe was developed for North Carolina’s Farm to School program as part of Chef Cyndie’s K12 Culinary Team. I like introducing schools to a different way of preparing broccoli; roasting rather than steaming! 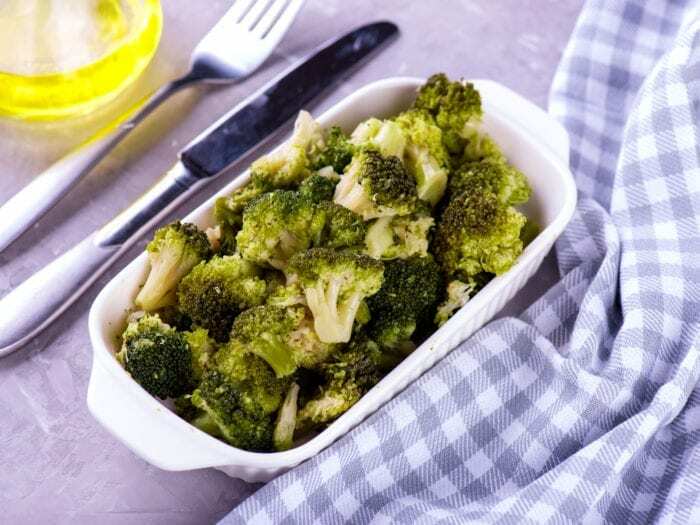 Roasted Parmesan BroccolliThe Broccoli recipe was developed for North Carolina’s Farm to School program as part of Chef Cyndie’s K12 Culinary Team. I like introducing schools to a different way of preparing broccoli; roasting rather than steaming!